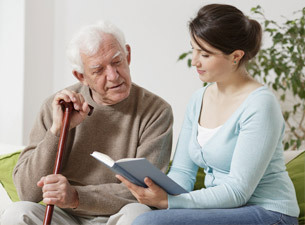 When you are a caregiver for a loved one, it is a significant role. Often taking up most of your time, it becomes hard to focus on doing anything for yourself, especially if you are the primary caregiver and have no assistance from any other family or medical staff. Despite the responsibilities you have, it is crucial that you take some time to do the things that make you an individual. Otherwise, you risk burning out. A key component of being able to stay healthy is to maintain your social life. Social Media: Through social media groups, you can discover online support and advocacy groups where you will be able to talk to those who have been in your position and can offer practical support. Installing apps on your phone also allows you to maintain this level of social connection while you are in the home with your loved one and can tend to their needs should any arise. Social media is an excellent way to stay in contact with friends and family. Another benefit of social media, if you choose to use it in this way, is anonymity. You can create a blog or online profile on a site such as Twitter to help release your feelings and experiences instead of keeping them inside where they contribute to stress. The ability to vent and get things out, even if it is to no one in particular, will help you to relax and ward off caregiver burnout. Ensure You Schedule Social Time: Try to make time for a visit with friends or family members at least once a week, and more if your caregiving role allows. It could be something simple like a walk or a quick coffee, or more in-depth like a meal or a movie. Don’t cancel these plans for anything short of an emergency. This time is important and allows you to feel more in control over what happens in your life and reduces some of the feelings of depression or helplessness you may encounter. 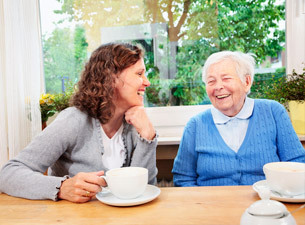 Talk to Understanding Friends: There is little point in trying to maintain social connections with those who don’t understand why you are taking on a caregiving role and only offer criticism and poor advice whenever you speak with them. Instead, seek people who improve your day when you have a conversation with them, and provide support and a friendly ear to listen when you need it. Often you can find these people at support groups for other caregivers should you choose to seek them out. Short but Frequent Contact: A brief phone call, quick online message, or simple text is sometimes all that is needed to break up the day. It helps to connect with people outside of the home and brings humor and entertainment into what might not be the greatest of days. It also provides a reminder that others still care and value you, even when you may be going through a difficult time with your caregiving tasks. At The Holiday Retirement, we provide short-term, respite care for your loved one so you can take some time for yourself. Rest easy knowing they will be safe, comfortable, and well looked after while you’re away. Give us a call at 401-765-1440 for more information about our skilled nursing facility in Manville, Rhode Island. We are happy to look after those you care for and always treat them as if they were our own family. Fill out this online form if you would like to book a tour.